Harrodsburg, Kentucky native Natalie Berry has performed Country, Classic Rock, Blues and Jazz. She has appeared as Eliza Doolittle, Patsy Cline and Dolly Tate as well as in operas and stage plays. Along with numerous appearances on TV and in radio, she regularly appeared at Renfro Valley as staff M.C. and comedian from 2012-2016. She also worked as Entertainment Director for Corydon Live in Corydon, Indiana. One of the most popular and versatile entertainers on the country music circuit, Natalie was named America's First "Japan! Idol" by the Japan America Society of Kentucky. 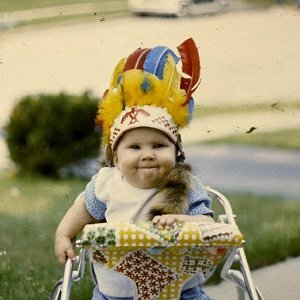 She has opened for the Kentucky Headhunters, Moe Bandy and Marty Brown. 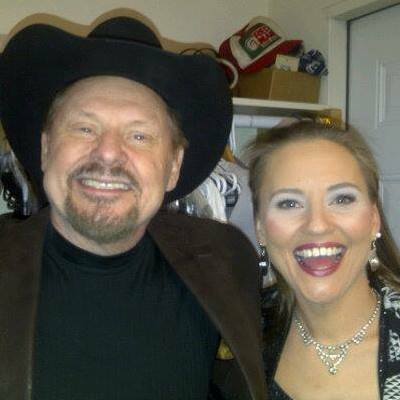 She has also shared the stage with Nashville legends Larry Cordle and Doug Jernigan. She regularly appears at Oprys and Jamborees throughout Kentucky, Indiana and Ohio. She currently serves on the Board of Directors for the Ragged Edge Theater and volunteers for the Habitat for Humanity and Liberty in North Korea. Whether belting out a sultry ballad or an up-tempo version of "Bill Bailey", she keeps her audience captivated and her comedic whit and goofy grin are always welcomed by her fans. 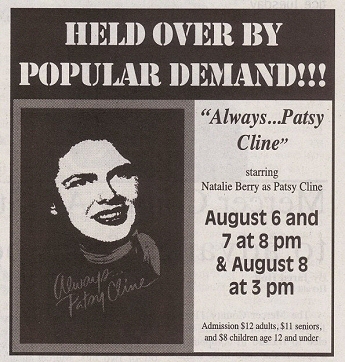 Poster for Natalie's portrayal of Patsy Cline in "Always... 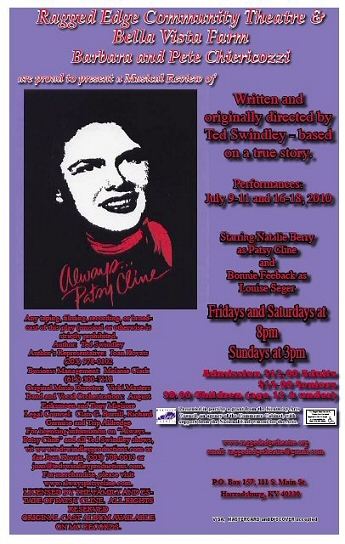 Patsy Cline", the role that started it all! Newspaper notice of the show being held over.